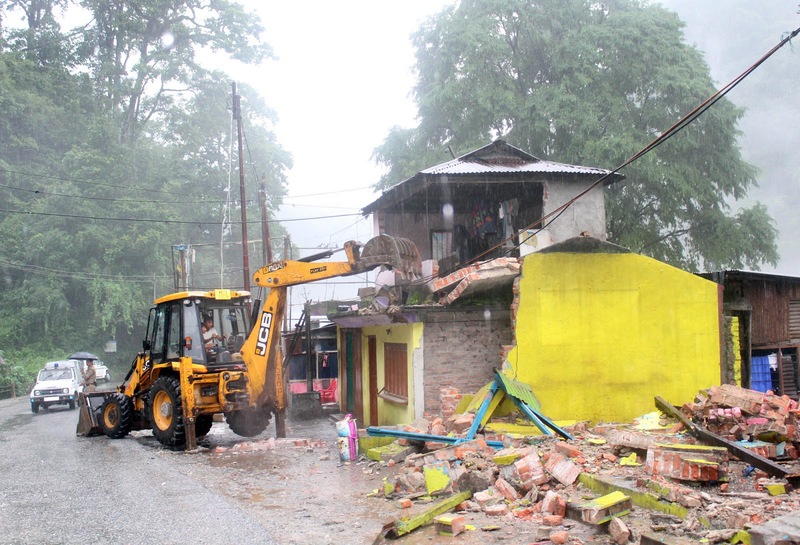 The Darjeeling district administration today demolished 13 houses at 29th Mile on National Highway 10. 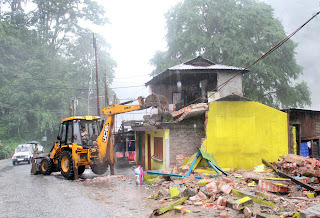 The houses,which were in a precarious position, were demolished in the presence of huge police team under the leadership of a magistrate Mr Bimalendu Das. The 13 buildings including commercial units were located at 29th Mile Bazaar on the banks of the Teesta. The buildings have to be vacated every monsoon because of obstruction of the river course by the NHPCIII Low Dam project located at 27th Mile. A senior official in Kalimpong Mr Nirmalya Gharami said show cause notices were served to the occupants and later they were asked to vacate the land within a certain period. Sources there were more than 71 houses which will be demolished in the next phase. According to officials, the primary objective is to save the lives of people living in these vulnerable areas.Two excavators were pressed into service during eviction drive. “These houses were in an extremely precarious position. Though these were illegal encroachments,compensation has been approved for all these 13 houses.Eleven house owners had accepted the compensation two years back and given an undertaking that they will move out.However,they did not do so,” Mr Srivastava added. houses. “Almost no house had any furniture inside and it appears these families were just holding on to these structures despite receiving compensation,”Mr Srivastava maintained. amount due to some dispute.The NHPC had allocated Rs 1.07 crore as compensation for all 13 families. 0 Respones to "Govt demolishes 13 houses on Teesta banks"